A panoramic view of paintings from former president George W. Bush's "Portraits of Courage" series is seen at the Bush Presidential Museum in Dallas, Texas (K. Farabaugh/VOA). Afghanistan war veteran Johnnie Yellock’s portrait is in the lower center of the first panel. When Johnnie Yellock enlisted in the U.S. Air Force, he knew his job as a combat controller would frequently put him in harm's way. Although he was prepared, war has a way of changing the best-laid plans. Even Johnnie Yellock’s. During a deployment to eastern Afghanistan, on July 6, 2011, the vehicle he was traveling in struck an improvised explosive device, or IED. The force of the blast tore through his body. Although he had to apply a tourniquet to both of his own legs to stop the bleeding, he continued to help his team by calling in the evacuation flight that would lift them to safety and desperately needed medical assistance. But instead of being relieved, Yellock was frustrated he couldn’t stay in the fight. Yellock’s encounter with the IED that July day in Afghanistan ultimately ended his military career, and began a rehabilitation effort that continues today. While that journey might have taken him off the battlefield, it has put him in an art gallery at the George W. Bush Presidential Museum in Dallas, Texas, where Yellock isn’t just visiting the exhibits. He’s a featured subject. Yellock is a member of Team 43, as in the 43rd President of the United States, George W. Bush, who has focused much of his post-presidential work to helping wounded “warriors” like Johnnie Yellock adjust to civilian life. In an exclusive interview with VOA, the former president spoke about Yellock and other veterans who are the inspiration behind his yearlong effort to paint their portraits for an exhibit and book, titled Portraits of Courage: A Commander-in-Chief’s Tribute to America’s Warriors. But engaging in sports is one thing. Painting their portraits is quite another. “How is a person who is agnostic on art for most of his life become a painter?” the former president asked himself. The answer? The pastime of war-time British prime minister Winston Churchill. “I happened to read Churchill’s essay, 'Painting as a Pastime.' I’m a big admirer of Winston Churchill, and in essence, I said if this guy can paint, I can paint,” Bush said. At first, Bush painted simple objects. Then he transitioned to pets, and moved on to world leaders, until his idea for Portraits of Courage began to take shape more than a year ago. It’s a tribute to those who Bush, as commander-in-chief of the United States military, was ultimately responsible for sending into harm’s way. Former president George W. Bush is interviewed by VOA's Kane Farabaugh at the Bush Presidential Museum in Dallas, Texas. It’s that kind of sentiment that kept Bush motivated to take a brush to canvas, day after day. Of the 98 veterans portrayed in Bush’s artwork for the project, Yellock is featured on a four-panel mural, next to several of his friends. Bush says he hopes the art speaks for itself, but Portraits of Courage is more than just an exhibit. It’s a fundraiser to help other veterans. All proceeds from the sale of the Portraits of Courage book, including a more expensive, limited edition signed by the former president, will help fund programs of the George W. Bush Institute’s Military Service Initiative, which aims to help military members transition to civilian life, help veterans find employment if needed, and address ways to treat both the visible and invisible injuries of war. He is the recipient of the Bronze Star and Purple Heart, among other military decorations. While he is honored to be a part of the exhibit, just don’t call him a hero. “Those that don’t come home ... those are the heroes of our time,” he told VOA. Johnnie Yellock holds his hand next to his portrait painted by former president George W. Bush. The bracelet on Yellock's hand bears the names of four of his personal heroes. “Those that don’t come home ... those are the heroes of our time,” he says. Four of Yellock’s personal heroes have their names engraved on a bracelet he seldom takes off. They were with him when he stood by Bush to announce the opening of the exhibit, and serve as a lasting reminder to Yellock of the ultimate sacrifice from a war that still continues today. 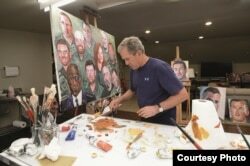 The original paintings of Portraits of Courage: A commander-in-chief’s Tribute to America’s Warriors are on display at the Bush Presidential Museum through October.